GEORGETOWN, Guyana, CMC – Chairman of the Guyana Elections Commission (GECOM), retired Justice James Patterson, Tuesday said that fresh regional and general elections could only be held in Guyana in November. 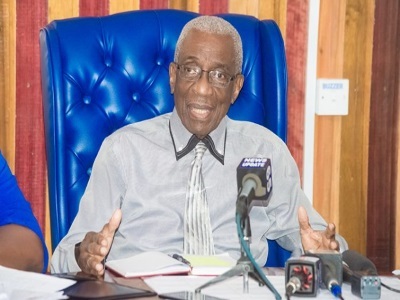 In a letter to President David Granger, the GECOM chairman wrote that “I would proffer that the Commission would be in a position to conduct General and Regional Elections no earlier than late November with an Official List of Electors having a qualifying date of 31stOctober 2019”. In his letter, Patterson apologised for his late response to Granger’s earlier letter, stating that consultations with his chief elections officer and senior staff “were a necessary prerequisite” to the contents of the letter. He wrote that as of February 5, this year “the Commission was intimately aware that it was impossible to conduct elections ‘within the three months” timeframe commencing 21 st December 2018” and that it is also impossible to do so on any date prior to and including 30th April 2019”. Patterson said that this position had been communicated to Granger in a letter dated February 21 and since then the process has “been continuously frustrated by the withdrawal of some Commissioners from our official meetings. “This has occurred at every session convened since 28th February 2019, including the Commission’s last meeting on 14 March 2019”. Patterson also indicated that funds were needed for GECOM to hold credible elections, saying that he has been advised by the “Chief Elections Officer, that given all our current considerations, an amount of three and a half billion Guyana dollars (One Guyana dollar=US$0.004 cents) is required. “Kindly note that significant critical path activities associated with elections cannot commence prior to the availability of these funds to the Commission. In the circumstances no election date should be contemplated less than five months after these funds are placed at the disposal of and the control of GECOM”. Patterson also made reference to the electoral list noting that he has been informed by the Chief Elections Officer and the Commissioner of Registration that “given the current time and operational status, it would be a logistical impossibility for the Commission’s Secretariat to produce a list with a qualifying date of 30th April 2019, which could be available for 1st May, 2019”. “Accordingly, the Secretariat’s submission to the Commission all viable options for the availability of an electoral list are anchored in a qualifying date of 31st October 2019 which lists cannot be used before 1stNovember 2019”. He said that among the Secretariat’s submission “was the proposal to have elections after the completion of a New National Register of Registrants (NRR) based on the conduct of a House to House registration exercise”. Patterson wrote in that proposal, the contemplated finish date was February 2020. But he said that “with a significant increase in the allocated resources for that exercise and an adjustment in the management arrangements for some procurement activities, the execution of the programme could be restructured to be completed at least two months earlier, in 2019”. “Should this be achieved most of the Commission’s concern for credibility and timeliness would be addressed. I would therefore urge you to support this by providing the required additional resources and appropriate guidance to those agencies and authorities whose co-operation is required if our objectives are to be achieved,” Patterson wrote.